The 6-in-1 USB-C Hub is an ideal solution for laptops and other devices with USB-C port. It enables you to charge your USB PD supported Type-C devices with their original charger while simultaneously streaming videos up to 4K 30Hz UHD (3840 by 2160) to your TV, monitor or projector and transferring files through the USB 3.0 ports or memory card slots. 6-in-1 USB-C Hub: Extend one USB3.1 Power Delivery Type-C charging port, one 4K HD output port, two SuperSpeed USB 3.0 ports, one SD memory card slot and one TF (Micro SD) memory card slot. 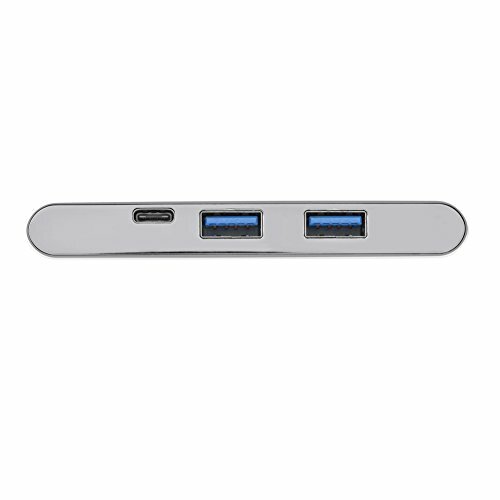 2 Ports Super Speed USB 3.0 HUB: allow you to simultaneously connect up to 2 USB-A peripherals (e.g. keyboard, mouse, speaker, U disk, etc.) to a USB-C laptop and transfer data at up to 5 Gbps. Backward compatible with USB 2.0 and USB 1.1. PD USB-C Port: Connect to a USB-C power adapter and charge the connected PD enabled USB-C laptop via its Type-C charging port while connecting multiple peripherals and transferring data. 4K Video HD Output Adapter: Enable you to mirror or extend the display of your laptop to your HDTV, monitor or projector in up to 4K UHD (3840 by 2160) resolution through the HD output port. Backward compatible with 2K/1080p/720p/480p/360p resolutions. SD/TF Card Reader: Fast transfer files between your memory card and your USB-C laptop.